I count myself quite lucky that with my job I have been given the opportunity to go to India, not once, but twice. As I sit chatting to you in Starbucks back in Bristol, I’m still suffering slightly with jetlag (who knew a five and a half hour time difference could be so difficult to adjust to?!) and I am seriously not looking forward to the backlog of work I have waiting for me in the office tomorrow, but I thought I’d take the time to share my experiences while it’s still fresh in my mind. I swear if I close my eyes I can still hear the car horns. But what I wanted to share isn’t about the car horns, or the death defying traffic (cars don’t wait for a break in the traffic to cross a lane, instead they just nose out until someone has no choice but to stop or go around them), or even the beautiful colours of the women’s traditional Indian dress (colours that appear somewhat brighter against the brown dry dirt colour of the streets). No, instead I want to tell you about the trip we took to Robber’s Cave near Sahastradhara. 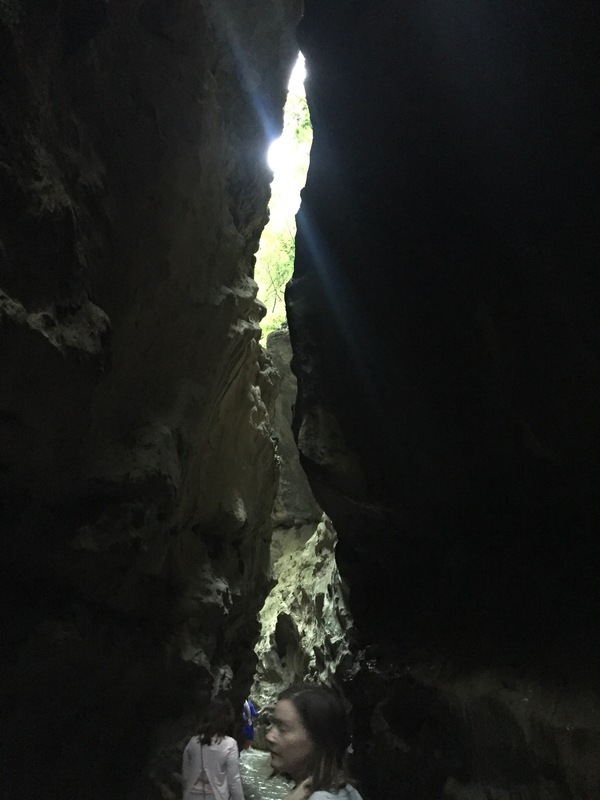 We were visiting offices in Dehradun (while staying in a hotel in the Himalayas, which still totally blows my mind…) and the cave is about 8km away from Dehradun city centre (according to good ol’ Wikipedia). Our hosts picked it as part of a day trip where we also visited Mussoorie (a hill station where the only access is a death defying road up the side of a mountain. If you think Indian drivers would drive more sensibly on this road then you’d be wrong.) 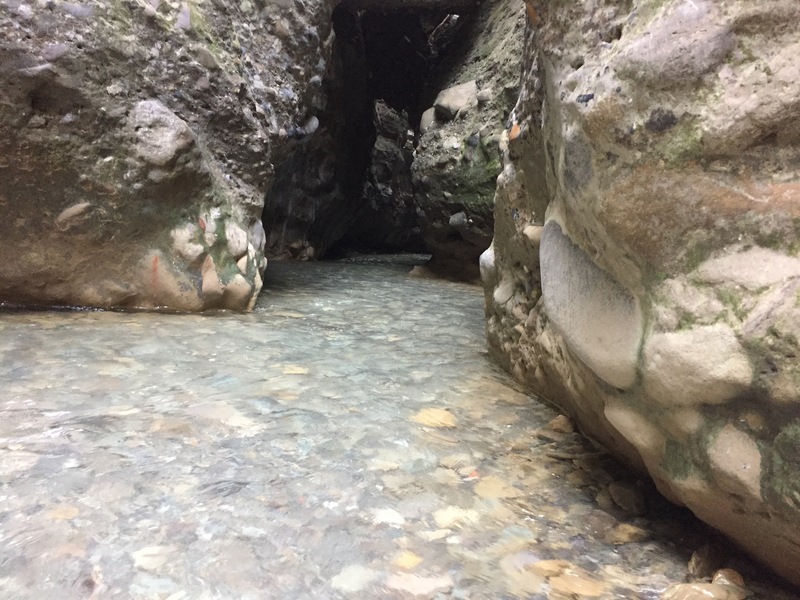 But anyway, I digress, Robber’s Cave is a narrow gorge in the middle of one of the mountains where natural spring water flows in a river from the top. Our hosts explained that at certain times of the year the gorge is completely under water, but in November, this isn’t the case. In the car park we swapped our trainers for sassy red flip flops (which handily matched the top I was wearing) and headed for the mouth of the cave. 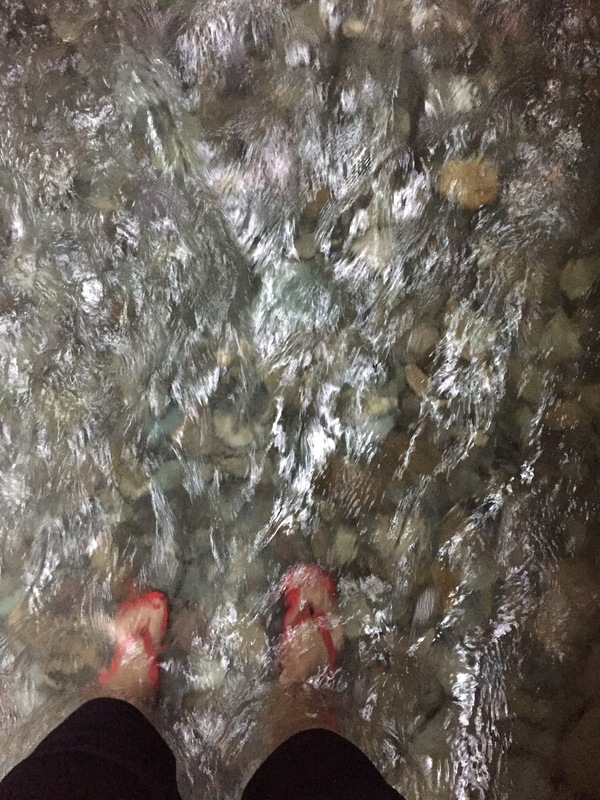 The reason for the flip flops was because walking through the gorge meant wading through the river. Thankfully it was no higher than calf height, so we rolled up our trousers and prayed that it wouldn’t be ice cold. At this time of the year there’s already snow gathering on the highest peaks, but obviously the water had travelled a long way in the sun to form this stream. I won’t go as far as to say it was warm, but the initial cold didn’t last long as our bodies adjusted to the temperature. Wading through the water against the current felt a little bit like a workout, but I was glad of that after a week of no exercise! Walking through the narrow gorge holding on to the rocks on either side to hopefully prevent face planting the water! The water was, by the way, crystal clear and the sun was peaking through the higher points of the rock making the whole experience feel somewhat majestic. On the way to the end we saw trickling waterfalls and pretty impressive rock formations from where they had either fallen or had been sculpted by higher water levels over the years. At the end was a fast-flowing waterfall that looked a bit like a jacuzzi, the water had taken on a kind of green/blue hue which looked far too inviting. I have no idea how deep it was, but if someone told me it was shallow I may have just got in and had a seat! The thing that I loved most about Robber’s Cave? The noise. 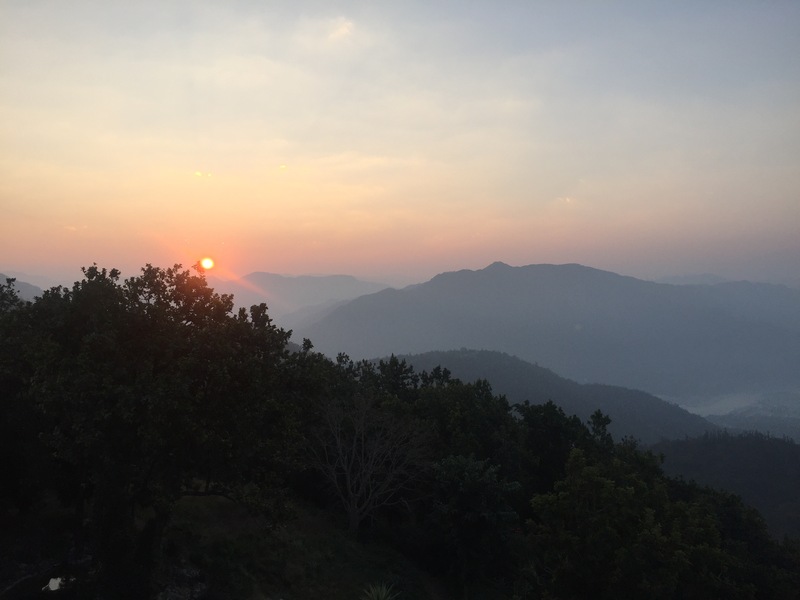 With nothing but the sound of distant running water gradually getting louder as we neared the end, it was a welcome break from the chaos I have come to associate with India. I have always found water to be incredibly soothing (I even fall asleep with rain or wave sounds playing on my phone, don’t laugh) so there was something really peaceful and tranquil about the caves. When I got to the end I have to say I didn’t feel like I was in a cave, certainly not by my definition of one, instead the narrow gorge opened up to a circular area with an abundance of greenery growing round the edges at the top of the rocks. A little sun trap that made you feel like you could be in a fancy spa rather than a cave in the Himalayas. I mean, I know where I’d rather be! Walking back out, this time with the current, a group of young people were on their way in and they were yelling and singing. It did kind of break the tranquillity of the cave, but I found myself laughing along with them as they were clearly having a great time. Now, I know me, I know how irritable I can be, particularly when it comes to youths, but for some reason, instead of being irritated by their unnecessary noise, I just laughed. That cave really does have majestic powers! As we neared the mouth of the gorge and prepared to step back onto dry land, I snapped the pic that I’ve made the feature image of this post. I love the light and shade of it and the reflection in the water. The silhouetted people in the distance are strangers about to embark on their own journey through the gorge. Finally, I love the green. It’s so much brighter with the sun shining through the leaves. Anyone who has been to the cities in India will know that there aren’t a lot of trees (or at least, the cities I’ve been to!) It’s probably my favourite picture of any picture I’ve ever taken and hands down my favourite experience from this year’s India trip.